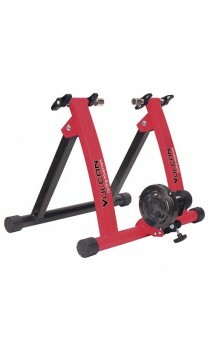 This magnetic home bicycle trainer enables you to train in the comfort of your livingroom or garage. The RavX TX1 indoor trainer is perfect for those times when it is rainy or too hot to go out and get your daily ride. Your road bike or mountain bike simply attaches to the TX1 and you can ride it like a spin bike indoors. The Tx1 features smooth and quiet magnetic resistance to take your workout to the limit. The TX1 also comes with a quick release skewer.